This trio of short performances from Birmingham Royal Ballet is an eclectic mix of dance, but each sums up exactly what the Company has excelled in over the past 25 years. There is the traditional, classic style epitomised in Theme and Variations; the modern sensualness of Kin. and the exuberant story-telling and character work in Enigma Variations (My Friends Pictured Within). Continuing to mark its 25th year in style, Birmingham Royal Ballet brought together three of its memorable short pieces at Birmingham Hippodrome. Theme and Variations opened the production with utter decadence. The ballerinas glistened in white tutus and jewels amid a stage soaked in grandeur. I heard a few gasps as the curtain rose to reveal a scene that could have been out of a fairytale. 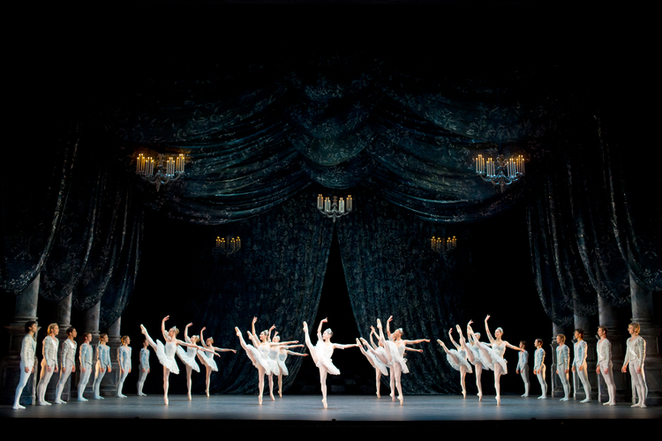 This work choreographed by George Balanchine has been described as a love letter to classical Russian ballet. Balanchine seems to have taken the best bits of several traditional ballets and condensed them down to 24 minutes of scintillating dance to the final movement of Tchaikovsky's Orchestral Suite No.3. Principal dancers Momoko Hirata and Joseph Caley are worthy leads in this piece, which was the first work performed by Birmingham Royal Ballet in 1990 at Birmingham Hippodrome. There's a complete change in style and music as abstract ballet Kin. takes to the stage. The title is an abbreviation of kinetic movement. 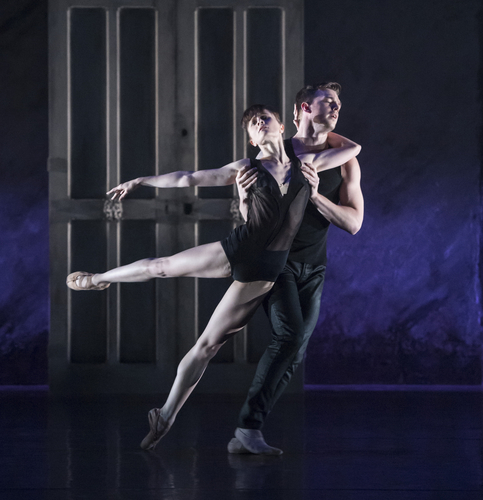 It's a contemporary, stylish and wonderfully sensual piece of work by former Birmingham Royal Ballet dancer Alexander Whitley and set to a score by Phil Kline. Kin, which received its world premiere at Birmingham's Crescent Theatre in April 2014, merges together athleticism and the precision of balance. The lively movements of the many dancers are fascinating but it's the sensual, moody pas de deux that catches the attention. Elisha Willis takes the lead in this piece with great style. 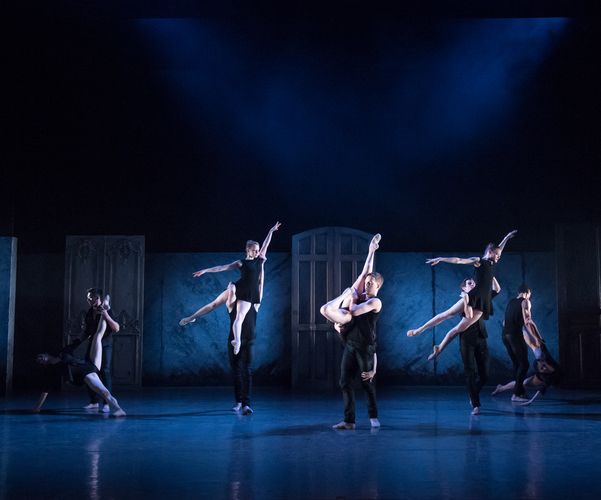 Enigma Variations (My Friends Pictured Within) is the third and final performance, which emphasises the Company's talent for detailed characterisations and glorious sets. 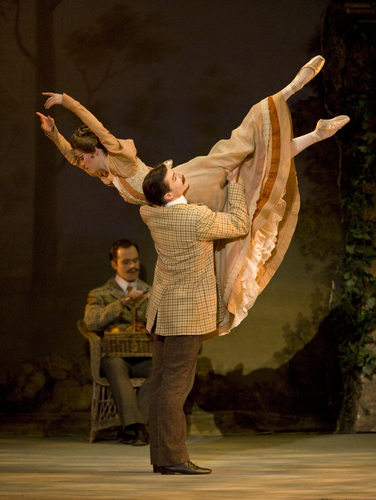 This is an elegant and eccentric character ballet that depicts Frederick Ashton's take on Edward Elgar and his friends. It features a breathtaking set, glowing in amber tones around a finely-detailed Edwardian home and garden. Gradually, we are introduced to each of the beautifully dressed characters to a soundtrack of Elgar's powerful music. Based on real-life associates of the famous composer, there's the devoted wife and kids, the quirky eccentrics and scholarly friends, all with their own distinctive traits. The beauty of Ashton's choreography in this work is how well he has brought out the characters in each dance. However, it's not a story that flows from start to end but rather an elegant depiction of various people. First performed by Birmingham Royal Ballet in October 1994 at Birmingham Hippodrome, it's a sentimental performance to conclude the triple bill and cleverly ends with the dancers coming together for a freeze frame photograph of Elgar with all his nearest and dearest. The triple bill as a whole offers a trio of dance delights that showcase everything Birmingham Royal Ballet has to offer. Tickets cost from £10 from the Birmingham Hippodrome website.